Love this watch it look so good on. 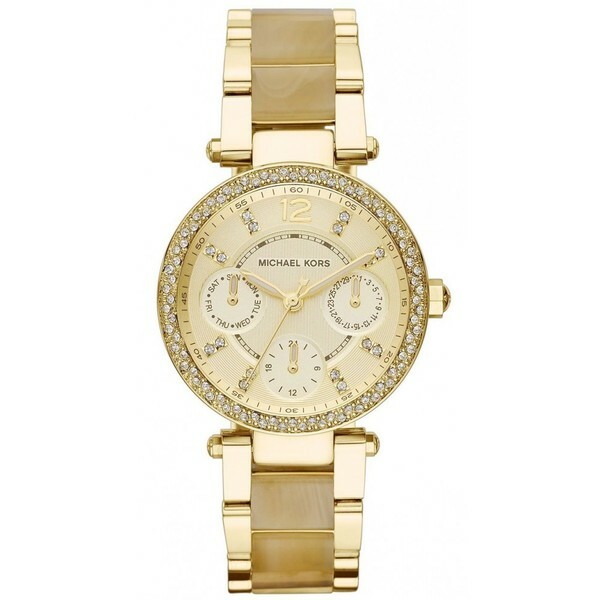 Gild your wrist with the glamorous look of gold with this Michael Kors Parker women's watch. This watch features a goldtone bracelet, case, dial, hands and markers for a polished look of extravagant luxury. Crystal accents on the bezel and hour markers add a bit of bright sparkle to the richness of the goldtone finish for extra elegance and style. A stainless steel case and bracelet provide durability, and precise quartz movement ensures accurate timekeeping. Three subdials provide day, date and 24-hour timer displays for quick reference, and a water resistance of 330 feet lets you wear the watch while swimming or or doing the dishes. The bracelet is secured with a fold-over clasp with a double push-button design for extra security. So attractive. Wear this everyday! Great price for such a beautiful watch. Would definitely recommend. It's a nice small watch, I have tiny wrists so it's just what I wanted. Love the detailing on it too. Got this as a present for my lady and she just loves it, great quality and looks amazing and expensive. Looks great in person as it does in the picture. Fits great!